According to the CDC, 17% of children in the United Sates are obese and that number is rapidly rising. Melvin the Magnificent wants to help your students learn more about healthy eating and active lifestyles. Melvin's new show for 2010 is "Melvin's Mission for Nutrition." 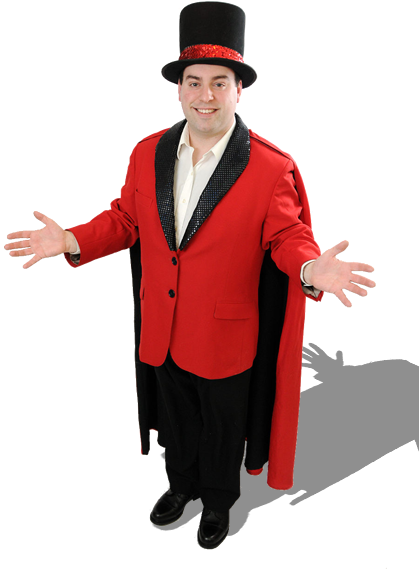 This show is interactive and fun using magic to entertain the children. They learn how fresh fruits and vegetables make them feel good and give them the energy they need each day. The show also features "Meal or no Meal" an exciting, interactive game show, full of magical fun and prizes. -The importance of a healthy breakfast. -The best snacks are fruit and veggies. -Physical activity and involvement in sports and teams. Melvin has been educating children for over twenty years with "Reading is Magic" and "Buggy Magic." All of the shows are designed to offer educationally significant information that reinforces what educators are introducing in classrooms. Each show is written and then reviewed by teachers and an MSW to ensure the performances are original and enlightening. I would love the opportunity to bring this brand new show in to your school. Resources are provided for the teachers to help reinforce the information presented. All of my programs are 40 minutes and the fee for my show is $450.00 for a half day (1-2 performances) or $800.00 for a full day (3-4 performances).